Another day, another wireless speaker release. But when it comes from audio heavyweight, Bose, it's time to sit up and take notice. Bose has the biggest range of wireless audio, stretching across amps, one-component audio systems, soundbars and home theatre systems and it's only getting bigger and more fully-featured. One of the most intriguing new features of its revised range is the tight integration with Spotify - the first WiFi speaker range to have full Spotify integration in its own app as well as through Spotify's. The new SoundTouch 10 is the latest in Bose's wireless family, offering a single component audio device with brand new Bose tech inside. It's not just loud though, the quality of the sound coming out of the new 2.5-inch Unidome transducer gives it a great depth. Bose reckons it's the most powerful transducer it has created in its 50-year history. The mid-range is powerful and the bass tightly-controlled. But because it's just a single unit there's no stereo effect and little separation in the sound. You can though link up a pair of SoundTouch 10 speakers to give a wider soundstage, via the PlayEverywhere link, but you can't set them up in stereo mode. Having both WiFi - at 5GHz - and Bluetooth connections on the revised SoundTouch range gives you the best of both worlds. For quick, easy access out-of-the-box you can go Bluetooth and for the higher quality streams, and for multiroom control, WiFi is the way forward. 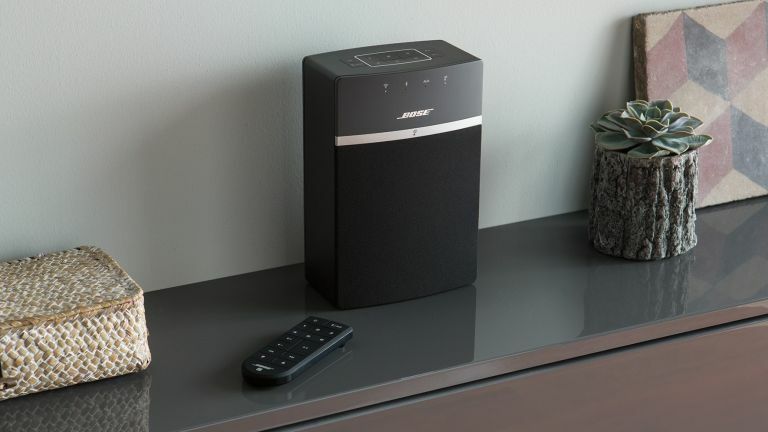 You can then link the SoundTouch 10 up to any of Bose other SoundTouch devices through the SoundTouch app, to control the WiFi skills of the range, or directly through a Bluetooth connection. Early next year the SoundTouch app will get an upgrade to deliver the Spotify integration, offering users the option to control the audio-streaming behemoth in multiple ways. With Spotify Connect you can just go through the company's app, with Bluetooth you can directly connect your device to the relevant SoundTouch speaker, through the preset buttons on the devices and their remotes you can play a Spotify album or playlist without ever touching your phone or finally through the integrated Spotify section of the SoundTouch app. Whichever way you want to go, Bose is supporting you. But can the SoundTouch range compete with the new Zeppelin?